Does Charismatic theology need a good Epiclesis? Does non-denominationality mean One Communion? A priest cannot assign to the laity the authority of absolution. This is not Anglican, but Packiam. An Anglican priest upholds the doctrine, discipline, and worship of the church…he doesn’t distort and abuse it, he doesn’t put himself in ascendency over it to pick around in it. I think you may be falling into this trap. Fr Don, I’d be interested in better understanding what the specific gap is here (truly and inquisitively not argumentatively…). As a layperson trying to pay attention to the details, there was a marked difference between before and after Glenn’s ordination, and quite noticeably concerning what you bring up. Before–to me, with minimal exposure to the matters at hand–it seemed, there wasn’t really so much an absolution. There was never any nature of “ego te absolvo…” from the pulpit nor was there any direction to say such to the person to your left or right. It seemed less like an absolution and more like a guided communal “declaration of grace” if you will. IIRC, it went something like this: “Say to the person next to you, ‘God forgives you in Jesus Name. '” (Glenn could share the exact wording.) I personally didn’t really see this as an “assignment to the laity the authority of absolution.” It neither seemed like an absolution nor an assignment (as that might trigger questions of who is doing the assigning by whose authority related to office and the like). After Glenn’s ordination, it’s been different and it’s been consistent (I believe…) with the text of Glenn’s blog here. While there has been a much greater shift to the office of the priest in this part of the liturgy, there’s still not an “ego te absolvo a peccatis tuis in nomine Patris, et Filii,+ et Spiritus Sancti.” (Actually there has been the “+” but not the “ego te absolvo..”.) The specific wording and your guiding comments here have made me start to go back to the English wordings of the rites of the BCPs over the centuries. Again, I’m just a curious lay person often with quite limited technical and spiritual understanding of the things that have divided Church and churches over the centuries. I wonder if it is safe to presume that Bp Ross approved the liturgy? As did Pastor Brady? I don’t really know. I have a number of questions. Perhaps it might be good to discuss with them too. What I personally do though love and respect is this–open respectful discussion–that clergy can discuss such matters here on the blogosphere. Personally I wonder if that these things get discussed openly and how they get discussed be among the greatest opportunities for witness in a world that has more talking than listening and even less shared understanding. I can only hope that this kind of discussion not be taken “offline” and that you and Glenn and Brady and Bp Ross (and others) join in constructive dialogue in the openness of the open, and most wonderfully, about what we’re talking about here–the forgiveness of sins. From this observer’s perspective, thank you for weighing in. The 1979 Rite I absolution seems more in line with the tradition of 1928, 1662, and 1552 (no surprise there). Since Glenn’s Anglican ordination, personally I don’t see anything hinting toward assignment to the laity the authority of absolution (unless I’m missing something and therefore need to welcome better understanding…). This is very important to those of us who have spent our lives as Anglican Christians…and we are passionate about people who come new to the church tampering with it without knowing its spiritual importance and effect, having not been properly trained in our doctrine and practice. I would agree with you about the need for discussion, but in fact that has been rejected. When this whole question of ordaining someone to be an Anglican Priest who was not an Anglican, not worshipping in an Anglican Church, not leading an Anglican congregation, nor working in an Anglican Church under the direction of trained & seasoned Anglican Priest, and having not been trained in Anglican priest craft in a residential semi-monastic setting that imparted an Anglican sense of mystery, Ken Ross called our bishop and insisted we not speak to him. One is called to the priesthood by the church, not as an aspect of one’s own personal journey…and here that discussion seems not to have occurred. Our problem is not that we object to what New Life and the free-church people do, it is that here Glenn is declaring it to be Anglican when it is not. Rolex doesn’t care if Seiko makes and sells watches, even if those watches have hands and faces, but you can bet they would be upset if Seiko started branding their watches as Rolexes. Firstly, fiddling with the liturgy, most especially the Eucharist prayer is really beyond the authority of the individual priest, and something only done by consensus of the church as a whole. Different from independent non-denominational churches, in the Anglican we have a set doctrine, a set discipline and practice, a set form of worship to which we subject ourselves at our ordination…at ordination we give up our personal preferences and subscribe to those of the historic church. life, and the grace and consolation of his Holy Spirit. Amen. Of course there would not be a celebration of the Holy Eucharist without a priest, so no need for this sort of diaconal or lay pronouncement on a Sunday morning…this rubric anticipates bringing reserved already consecrated sacrament to the sick and shut-in by deacons and lay persons so licensed. Here is the more classic absolution that spells out the dynamic a bit more completely. Next Glenn’s invitation to confession is not one found in any Anglican Prayer Book…and although the invitation is supposed to be a strong call and challenge, the invitation used here describes itself as merely a nudge. Confession in our liturgy is corporate, communal, but Glenn uses the word ‘you’ in a very personal sense, very much the protestant soft my Jesus and me sense. Anglican liturgy is common and communal. Note from above that when a Bishop is present, the bishop absolves, otherwise it is only a priest who absolves…no one else. Also, there is no Anglican liturgy in which the priest says, “I absolve you.” Instead, we say that penitents are absolved through Jesus Christ. Liturgical statements are approved by the church, not by individual pastors and not by bishops, least they become like this liturgy…missing major parts, and thus distorting the faith and doctrine of the church. One of the things that strikes our clergy team that has looked at this (we all have graduated from three year residential seminaries and have master in divinity degrees and studied for years under senior priests) is this seems to be more about Glenn than the church. The church has priests, and the church’s words to be said in the church’s liturgy are indicated as such by Priest or Celebrate…taking the focus away from an individual who has constructed a liturgy, and focusing instead on the priestly servant who officiates in a specific church ordained role in the church’s liturgy. In the 39 articles it is the position of priest rightly ordained, not the character (personality) of the individual, upon which the validity of the sacrament depends. Here Glenn uses ‘Me’…it is Glenn, just like the web sites attached to New Life are about Glenn…not Anglicanism, not the church. Check out our site to see how little our personalities play into the identity of St George’s. Let me here again make the important point that what New Life does is not our concern, and we respect it within the broader church, but please don’t call it Anglican…so none of this is a criticism of any other forms within our larger Christian family or of Glenn, it is just mistaken to call this Anglicanism. In Anglicanism the liturgy belongs to the church and decisions about it are decided in the councils of the church. The liturgy does not belong to the individual priest or even a worship team…once again referring to the priest’s function as ‘me’ indicates the liturgy belongs to Glenn and not the church of which he purports to be a priest. The priest at ordination commits his life to upholding the doctrine, discipline, and worship of the church, not fiddling with it. Back to the liturgy herein described by Glenn, he has eliminated the Sanctus: Holy, Holy, Holy…the tradition entry point to God’s real presence, although perhaps as Glenn writes elsewhere that Communion is a metaphor…maybe he doesn’t believe in Christ’s true presence. The Sanctus is important to set us in proper posture that we come to worship the Holy God, and not ourselves or our buddy Jesus…it is an entry point to a transcendent experience, and sets the context for communion with God and the communion with the saints (the saints not mentioned at all here…joining our voices with angels and archangels and all the company of heaven). This could be a protestant nuance against catholic doctrine from reformation times, but Anglicanism is not an expression of the continental reformation…another important discussion if one is to be an Anglican. Also omitted here is the theology and history of what we are doing (…for that thou of thy tender mercy didst give thine only Son Jesus Christ to suffer death upon the Cross for our redemption…”). This is actually required by the rubrics of even the most modern of consecration prayers. A hallmark of Anglican liturgy is the balance between word and sacrament. This consecration (which is partial at best and incomplete and not efficacious at worst) is so short that it would need to be balancing a one minute blessed little thought instead of a full sermon. Now if the sermon was 30 minutes long with this one minute consecration prayer the whole and very important Anglican balance is again simply not there, and you have a free church protestant liturgy…nothing wrong with that, it is just not historic Anglican liturgy, which Glenn is purporting it to be in this article. The Oblation and Anamnesis are omitted from this prayer of consecration, so the gifts of bread and wine are not being offered up to God for his blessing, and there is no sense of remembrance here, of bringing the past into the present and giving us foretaste of the future…lifting history into heaven and bringing heaven into history…crucial elements of Anglican liturgy. The Epiclesis is in essence offered by the congregation in the invitation to “Stretch your hands forwards as a Kingdom of priests.” This has no precedent in historic Anglicanism. Only the priest is able to perform this liturgical act. There is no Great Amen at the end of the consecration which is the final proclamation of the congregation that they are in agreement, that they ascent to what has just occurred. So you see, this is simply not Anglicanism. Even under the loose rubrics of “Rite III” in the 1979 Prayer Book, vital elements of the Eucharistic Prayer are missing. 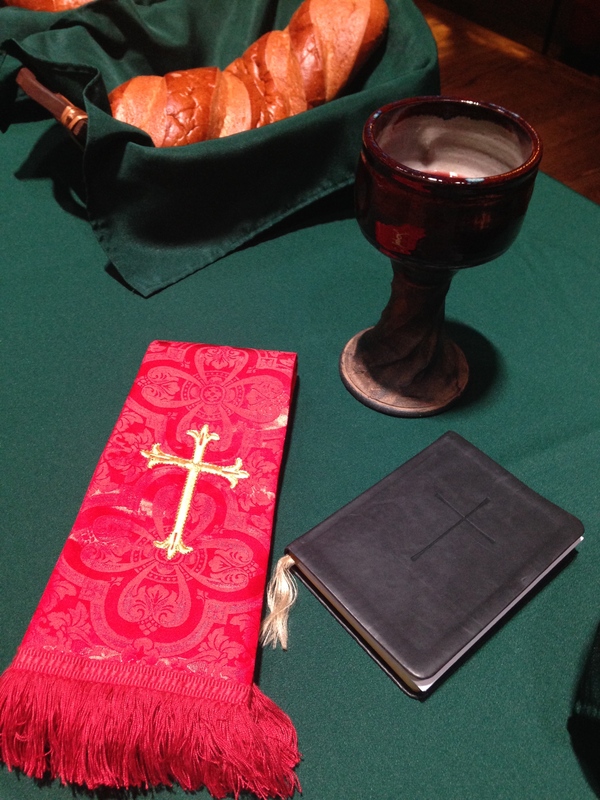 For Anglicans, only the Church has the authority to appoint and authorize liturgies. It is the job of the individual priest to use the liturgies that are provided, not to simply make up his own. From many respects there is a major authority issue here. As a priest, Mr. Packiam is under orders and discipline to provide what the Anglican church has approved. He has clearly shown that he does not understand this authority. So perhaps the bigger issue here is not what he is doing. That is fine for any Protestant to take elements from the prayer book and uses them. But why, given his free church theology, ecclesiology, and liturgical practice does he want to be an Anglican, because once you have submitted yourself to Anglican orders, you have to live into those orders. Otherwise, what is the point? And that is our point! Now this is not really Glenn’s fault. Ken Ross has led him astray thinking he can do this. Glenn has no other way to know that what he is doing is inappropriate. But all of this is something of a scandal in the larger Anglican Church in North America and in our House of Bishops, and it is in that body, not on this blog, that this will be settled. For our part in Colorado Springs, whatever you want to do is none of our business, unless you brand it as Anglican and then we get very particular, because it is not Anglican and falsely represents to the Colorado Springs community what we hold spiritually historic and dear. There’s loads I could say, but perhaps only one is necessary: we do not claim to be an Anglican Church. We do not claim to follow an entire Anglican liturgy. It is an ecumenical service that I, as both a non-denominational pastor and an Anglican priest, preside over and serve in. Also, I will add that this has been helpful in spurring a great conversation with Bp. Ross and Rev. Steve Hoskins, and I will clarify both my language and my distinction between the absolution and the peace. (See above). The peace of the Lord. I think you have identified the problem: “a non-denominational pastor and an Anglican priest”. You can move from being a non-denominational pastor to being an Anglican priest…but ordination has ontological implications, so you cannot be both. Once a priest always and only a priest. discipline, and worship of The Anglican Church. What that means is that you can’t be faithful as an Anglican priest and just do any kind of liturgy…it must be the liturgy of the Anglican Church, not just part of it, but all of it, otherwise it becomes false teaching in a church that prays what it believes. The sacred order of priests has very specific commitments and obligations…that is all we are saying over here at St George’s. And either you honor those commitments and obligations as stated in your vows, which include worship…or with integrity do not identify yourself as an Anglican priest. My hope is that you would continue to identify yourself as an Anglican but with the help of those of us who have more years than you have days at this work, would do it by conforming to the canons and traditions, the doctrine and discipline of our church. And because of the close connections and overlapping relationships we have in our town, and the importance of this in the larger church, and the importance of modeling open and constructive dialogue which is so important to Anglican theological reflection…it is well worth my time, even with all the other things I have to do. Fr. Don, I hear you. But the impression of what the implications of my ordination mean for me as I serve in a non-denominational church is a conversation that needs to happen with those above me. You, Bp. Ross and others can have that. I can rest in knowing that with the changes made above, I have my bishop’s covering in this. I want St. George’s to thrive and do not see our work as hurting yours in any way. No one who is new to our church is coming because they believe it to be an Anglican Church. So, blessings as you continue to call people to Christ. Fr Don, thank you. Glenn, thank you. Hoping for continual dew of blessing. These are old and deep and important matters. There’s plenty of time. Plenty. Hoping for continual dew of blessing.